We all own domains. By ICANN law, we’re required fill out 'whois' information in order to register & purchase a domain. It is this information that becomes publicly available to anyone willing to search for it online. There’s several online services that monitor new domain registrations and setup automated emails to domain registrars emails pestering their willingness to “build your website” or offer to submit your new domain to “millions of search optimized engine backlinks”. The pestering doesn’t stop there. 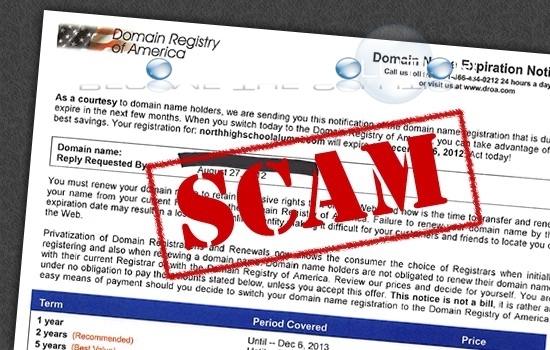 As a domain registrar myself, I own and manage several domains that I register under a business name and address. I am plagued by snail mail for my domains that offer to renew my domain. These letters are overwhelmingly teasing, in that they solicit your domain to look as if it’s expiring, or that your website may not be “paid in full”. Occasionally, these types of snail mail letters actually make it to the business we’re representing. I have my clients calling/emailing me asking why or what they were billed for. It’s embarrassing and untrustworthy. You tell them it’s not from you and that you own their domain, re-assuring them. I keep close contact will all my clients so this has never actually become an issue. I also auto-renew all domains as to never worry about them to expire. Anyone can do this. I would be curious to know who’s fallen for these fake bills, invoices, and quotes. Letter examples below. Happy 4th of July! !